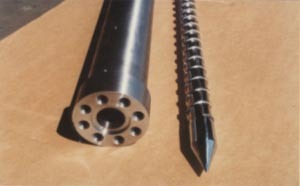 We are able to offer new screws and barrels from 3/4" (20mm) up to 3 1/2" (90mm) in size. Our machining capabilities include many design profiles from the traditional single stage screw to the much more complex barrier/wave configuration. 4140 alloy steel (general purpose extruder screw material), nitralloy 135m (general purpose injection screw material), 17-4ph stainless steel, monel k500, and hastalloy (corrosion resistant materials) are the primary materials used in the manufacture of our Al-Be plasticating screws. A bimetallic lined barrel blank is used exclusively on all the extrusion and injection barrels we manufacture. Linings can be provided for various operating parameters, general purpose, abrasion resistance, or corrosion resistance.